Very cool! Looks good to me. If you get results that is what counts. run a little awkward with the south there in this particular configuration. 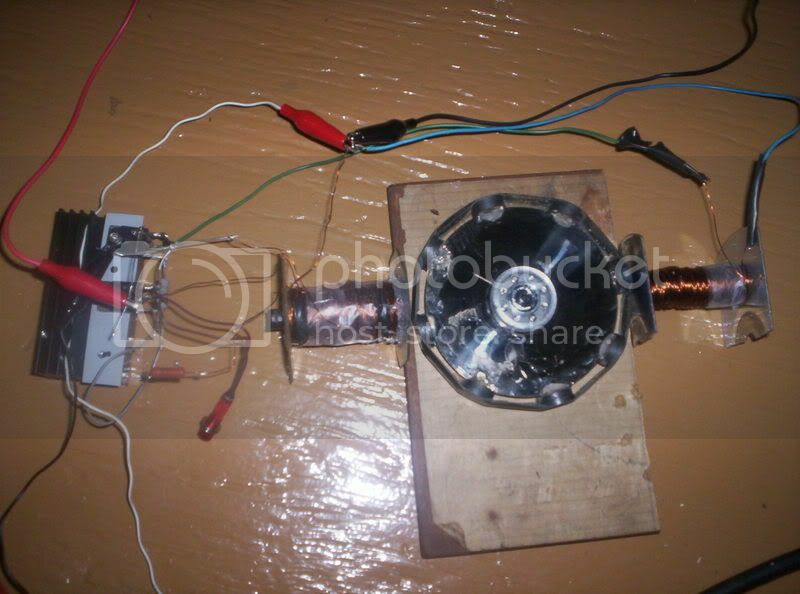 Here is a schematic for the tape wheel motor. The leads on the tape motor were already sticking out on really good pins. 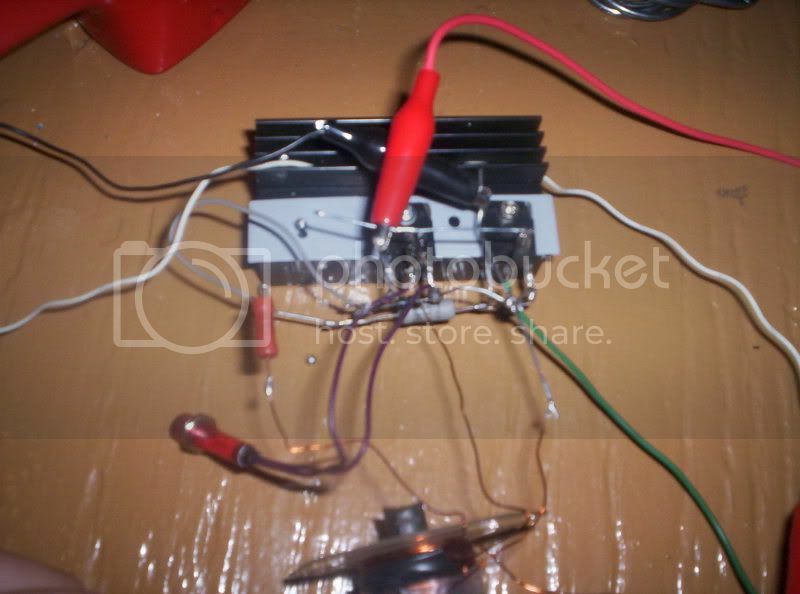 For a muffin fan motor for example, you'd have to open it and free up the leads on each coil and route them out. I'm charging a battery one one output and a cap on the other. This runs only clockwise as the induced current to trigger comes from the left side, which is connected to the base. The bulb and pot I have are between the trigger wire and the resistor. Last edited by Aaron; 11-08-2007 at 11:01 PM. Any comments on this vid? Not sure what to make of it. The diagram is a little hard to read...the one that pops up in the vid towards the end. Thanks for the schematic - very nice. Would it be permissible to take a resistance reading across one of the power coils and one of the trigger coils sometime since the ends of the coils are out in the open? It would be very interesting to see what they measure... especially for those of us who would like to try to replicate this version... I love that jet sound when it ramps up on 24 volts! ha! There are connections to the coil so that reading is accurate unless backwards through the circuit there is a connection. I would love to get a hold of one of these tape motors. I have been looking around, my Dad was a film maker before he passed away and Im hoping to get in touch with some of his work mates to see if they have any old reel to reel motors lying on the scrap heap. Would be good to see if anyone has dismantled one of these spools as I am unsure of the magnet configuration too. The little button fan I pulled apart had four coils but only one magnet strip going 360 degrees around. Also Aaron, do your two trigger coils interconnect? Like Ricks diagram from the monopole list (mods remove if inappropriate). Last edited by ren; 03-03-2009 at 12:06 AM. I tried unscrewing the nuts from the top center screw but the screw turns with it. There are 2 screws underneath the rotor and I'm not sure I can even do this without having to unmount it from the base so I'm not going to do that. If I was going to redo one of these motor styles, I would actually just modify a muffin fan so at least you get work from the rotor like blown air. It would be such a shame to tear apart a good reel to reel to get these motors...especially if they're from the 1970's because they're such good quality players. I just found some pics of some reel to reel motors and they look different from the one I have. I'm not 100% sure it came from a reel to reel. I thought it did. 3191D or 3191O or 31910 is a number printed on top. The 9 'could' be an 8. I couldn't find reference to it online. I wasnt going to dismantle a working unit, I would only scavenge the motors if it was on the tip. Thanks for info Aaron, I'll search around. Or maybe I'll just wind some coils with the same ohms. I just found a sight online that sells old vintage parts and spares for reel to reels. Last edited by ren; 11-10-2007 at 04:31 AM. i've got some questions regarding the SG. Im currently trying to improve my current design. But i need to know a bit more about winding coils. How do you actually wind it? lets say i'v got my twisted wire, and i've got my spool. I'ts really hard to go from left to right in one go, When i try stacking up the wire it wants to fall off to the side. And as far as i know i cant go back and forth winding it, because that will not result in a north and south pole. Is it possible to wind a thin layer from left to right, then go straight back and repeat the process? also i noted something very weird. When i connect a neon bulb to the charging output, only one of the filaments in the bulb lights up, is that normal? if the charge output lights up a neon bulb, is that proof of the motor being in sync? I personally think rpm has to go way up? cant you wind the coil any way as long s its facing north towards the magnets? In regards to coil winding guys. YOu can wind all the way up and then string it down (directional winding i think its called?) But I cant see any real benefit from this. Someone prove me wrong if there is. today i rewound my SG coil to get about 600-700 windings on there. And used an AM antenna ferrite core to see what would happen. SG charges A LOT better, but current draw has gone up from 70mA to 200mA I did add a potmeter to the trigger resistance to get it down, but that's as low as i can go. When i attach a neon bulb to charge output it nearly blows the bulb. But i also noted a weird side effect, when the rotor isn't turning the coil makes a high lets say 3khz buzzing noise, when i then change the resistance on the potmeter the frequency of the noise changes. This didn't happen with my first coil. ah ok thanks, good to know. well fine fixed that. Connected everything up, started it woohoo! went into self resonance with the bulb lighting up, accidently touched the wrong wire. DAMN! that hurts ive had some nasty shocks before, but nothing like this one! my chest still hurts. so not having my day today. now its running again, trying to revive a 50amphr car battery. i also have the buzzing sound when my sg is not spinning if i disconnect the charge battery it gets louder !? is it really normal? When disconnecting the charge battery on the output, it is like having a larger diameter exhaust allowing the motor to turn over faster and with more ease. There is less back pressure in the circuit. Reduce the resistance at the base to get rid of the oscillation. You don't want this effect if you're using a rotor. Otherwise, you can tune the oscillator if you want it to oscillate and don't want to use the rotor. well i tried reducing it and even tried it with no resistor could the buzzing be due to a short in the coil? i have found with a single strand tightly wound slave coil i get higher voltage collapsing spikes would this be a desired effect meaning a better voltage potential to a quire my radiant energy?? My name is Mike, I started researching these materials very recently, glued to the computer, reading and watching experiments from so many of you for the better part of the last two months. I feel like I just woke up. Am I understanding these behavioral concepts right ? The collapse of the pulse triggers a higher voltage potential in the exciter coil. This potential is then opened against a dense receiver of charges (the battery). The charges rush into this potential from everywhere it can, from the wires, from the battery, from the air, from the ground. The polarization of the battery's relatively large reaction cross section draws much of the charges into this space. The effect can also be seen outside of the battery as well, acting like a gas, drawing charges into it. If this is correct, what sort of battery would be the most efficient at receiving negative energy, of being a conduit for these charges? This question may be off-topic but is anyone working in this area or interested in it? So far I've built 2 working SGs, one mini and one full sized. The full sized is currently being upgraded with a new rotor & more magnets. If you all don't mind, I'd like to ask a question. Might be a dumb one, but I just can't seem to figure it out. Capspan rotor with 8 double stacked neos, 150 ft. of 22 & 26 wire with r60 welding rod core. A 1K ohm (986 actual) resistor on the trigger. The 1 ohm test passed with .16 volts and no NE light up. Primary bat is a converted 200 watt PSU putting out 12.46 volts. Charging battery is a worn out 12 volt cordless drill pack showing 3.688 volts. I load the battery down to 3.60 volts (after an hour of resting) and start charging it again. This time using a 630 CCA 12 volt starting battery on the back end. What is it about this old drill battery that causes the SG to be in over unity at low voltage? Posted a couple of vids on youtube about the bedini motor for beginners. If you notice any absolutly horrible errors could you let me know and I'll edit the vids before too many people see them! Since I've been struggling with the Bedini SG for a while and just gathering the required components it was will real pleasure that I viewed your videos to at last learn about how it all goes together! I guess I'm just too dumb to figure out how it is done from all the other recipes. for my first circuit i built it exactly like the schematic so there were wires everywhere but little by little eliminated them all and ended up with that layout. Sephiroth, that was a top notch "how to" vids! The numbered wiring was a VERY nice touch. Keep em coming! i came across this neat bedini energizer YouTube - Micro_SG - fastest, lowest power SG on the planet!